Easily one of the most visually stunning cities in the world, Rio is a staggering mix of new and old, man-made and natural beauty, favelas and glitzy apartment blocks. The effervescent locals are adept at making life look easy, as they wander the streets near the beach in their swimwear, play games after work on the sands and dance all night to samba beats. Be sure to head up Corcovado to see Christ the Redeemer up close and personal, and for a spectacular view of the city. Munch on deliciously sugary churros by Copacabana and sample some of the best restaurants and shopping malls in town. Some of the world’s best New World wines come from the countries of South America, and the valleys of vineyards are pretty places to visit. You can check into a boutique hotel amongst the vines and taste the local nectar and watch wine being made. Regions in Chile and Mendoza in Argentina are the best places to visit, although wine is also produced in Brazil, Peru and Uruguay. From these areas, you’ll enjoy the sunny climate the vines love, along with picturesque views of the Andes. Make the most of the evenings with a traditional asado – barbecue grill. 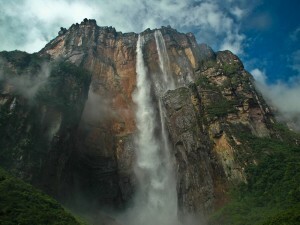 South America is home to two of the world’s most stunning waterfalls – Iguazu in Argentina and Angel Falls in Venezuela. The latter is the tallest waterfall on Earth, plunging uninterrupted for 807m (with total drop of 979m) from a table top mountain deep in the rainforest. The water source for this amazing waterfall is nothing more than the moisture-laden clouds in the forest above. The adventure to get here is a beautiful and exciting one. Iguazu Falls is the widest set of waterfalls in the world, spanning a distance of 2 kilometres. Made up of around 275 separate falls, the wooden walkways that direct you right in around the water make for an amazing experience. The surrounding rainforest is full of cheeky monkeys and other wildlife that make this one of the world’s most inspiring natural attractions. South America has more than its fair share of unusual landscapes, but the vast salt plains in Bolivia (the biggest in the world) have got to top the list. Accessed with a 4WD safari, there’s nothing like the hallucinogenic experience of driving into the blinding white wilderness with no horizon in sight. In fact, the perfect flatness and whiteness of the land makes it the ideal spot for calibrating satellites. Around the flats are volcanoes, bubbling geysers and hot springs, windswept deserts, multi-coloured lakes and flocks of bright pink flamingos.